We are very proud that we can announce that we have released X# Bandol RC 1 to our FOX subscribers. A public build of this product will follow shortly. This build has completed the VO and Vulcan compatible runtime. Unfortunately we found some last minute issues in the DBFCDX driver which could corrupt your indexes. We have therefore decided NOT to include the DBFCDX driver. An update for this will follow in a few weeks. This automatically creates a new variable <newvariable> that is only visible in the scope of the IF expression. which is almost what gets generated by the compiler. There are many larger and smaller changes in the runtime to make it more compatible with VO and Vulcan. In this article we would like to share with you our development roadmap for the coming months. We are now reaching the final stage of the development of the runtime for VO & Vulcan and we are looking at new things that you an expect the coming year. In the coming weeks we will release the first Release Candidate for the XSharp runtime. After that we expect to need a few weeks to finish the final remaining issues. The schedule show you what we have planned to do after that. The schedule below of course is an indication and as always: no guarantees. As you can see in the schedule above: we have not planned to do Xbase++ UI classes yet. We need a business case (someone with a business app that uses the Xbase++ UI classes) or someone that can help us to define what exactly is needed to do this. If you are missing something in this schedule, or if you want to help to implement / add something, please let us know. We welcome your input. This spring is going to be an exciting period. Not only will we present our product on the X# Summit in Austin, we also expect to finalize the development of the X# Runtime for VO & Vulcan. On top of that we will finish the implementation of the XBase++ dialect and we will start with the Visual FoxPro dialect. We are also preparing to promote our product at various FoxPro events around the world. X# is really becoming a mature product ! To celebrate this we have a special introductionary price for new subscribers to the Friends Of XSharp program. If you follow this link, or if you goto the order page on shareit and enter the coupon code "SPRING2019" you will receive a 25% discount on the normal price of € 999. This spring sale will end on June 21st. 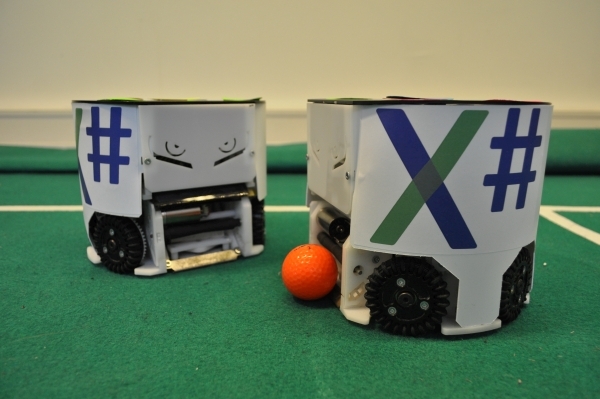 We are very proud that the Robot Soccer team, sponsored by the X# project, has qualified for the World Championshop Robot Soccer in Sydney. On the picture 2 of the robots during the training. We have just published the detailed session schedule for the X# Summit next week in Austin. Click here for the session schedule. Click here for the speaker and session descriptions. We still have a few seats free, so you can still register.